I have some good news: self-discipline is not an innate trait. It’s not something you have or you don’t; it’s a skill you develop. Tell me if this happens to you a lot: you want to do something but you just don’t feel like doing it a lot of the time. A common misconception is that disciplined people must somehow feel like doing things more than others do. This simply isn’t the case. 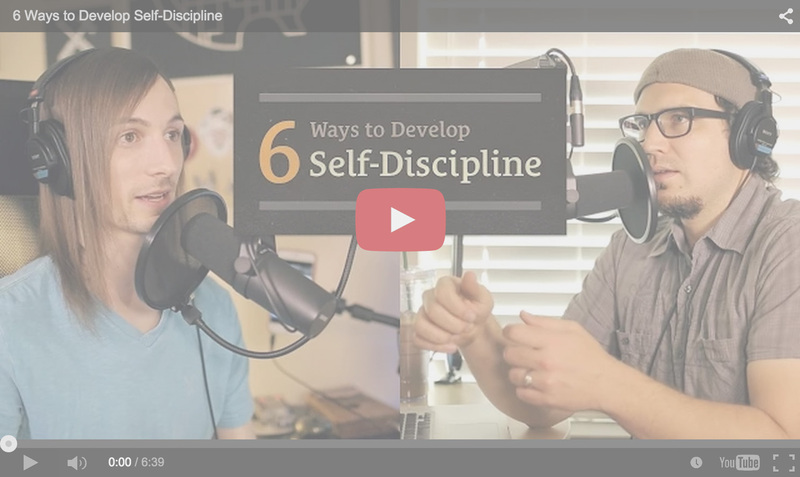 To help you develop the skill of discipline, we share 6 tips in this episode that will help you take the next step—whether it’s eating healthy, staying fit, waking up early, or showing up consistently. A productive day starts the night before. 04:23 Ben: You may be thinking to yourself, “That’s time I usually use to get things done. I stay up and I’m productive. If I go to bed early, where am I going to find the time to do that?” Don’t think of it as sacrificing these two or three hours of productivity, you’re shifting them to a more optimal space, which is in the morning. 04:57 Sean: We’ve talked about the importance of waking up early before and what that can do for you. I identify as a night owl but I couldn’t argue with the results of my work when I wake up early. I don’t like waking up early but I like the person I am when I do, and that’s why I do it (Related: e075 Why Early Birds Beat Night Owls Who Don’t Wake Up Early). 05:26 Ben: We’re not saying don’t get as much sleep. People might be worried what time is considered early, but don’t focus so much on the time you’re getting up. Get enough sleep and focus on when you would like to get up, then build backwards from there. If you’re going to wake up at a certain time, look at what time you would need to go to bed in order to get enough sleep. 05:56 Sean: Waking up early is really hard but why is it hard? It’s hard because you went to bed too late. If you go to bed early enough, waking up isn’t hard. Not going to bed on time is what’s causing the issue. If you’re sitting up in bed browsing Reddit on your phone at 2:30am, at that point it’s not a matter of willpower to get up early. It’s a physical limitation and your body can’t handle it. Your body isn’t going to do well the next day. You might be tricking yourself into thinking you can’t wake up early because it’s too hard for you. Of course it’s going to be hard if you’re up on Reddit at 2:30am! Maybe you need to put your phone in the other room and use an actual alarm clock, but whatever it is, you need to cut that stuff out. 06:54 Ben: The majority of successful people throughout history—people who have notable success—were early risers. 08:16 Sean: There are two steps to eliminating temptations. First, identify the temptations. It sounds obvious but it’s not, you actually need to sit down and think about this, “What are the temptations that I have?” Let’s say the goal is to be self-disciplined and focused in your work, and the temptation is checking Facebook, Twitter, Reddit, or texting someone. If you’re trying to eat healthy, maybe the temptation is the cupcakes, candy, or snacks in your kitchen. You have to identify your temptations, otherwise you’re not even going to realize they are temptations and the next thing you know, you’re half way through a package of Oreos and six episodes into the first season of Friends. 09:52 The second step is establishing a process for removal. I use what I call the, “white board trick,” where if I have a distraction come to mind, I write the name of it on the white board—Facebook, Twitter, Google Analytics, email. Whatever I’m not supposed to be doing right now, I write it on the white board and then I go back to work. If that same temptation comes back to me, I point myself to the white board and say to myself, “No, it’s up there. You can’t do it because you already wrote it down.” I keep adding to the list until I can’t think of anything else and my mind is clear, then I can focus. 10:37 If you have junk food in your kitchen, maybe you need to throw that out or even take it a step even further back and not go to the grocery store hungry. If you’re lacking the self-discipline to not buy bad food at the grocery store, maybe you need to pay someone else to pick up your groceries and get an accountability partner to look over the grocery list before you give it to whoever is picking them up for you. 11:27 Ben: In the chat room, Cory Miller asks, “I would love to hear your thoughts on forced discipline: apps and tools that block internet connectivity and certain websites at certain times, filters that keep you from going on social media, Do Not Disturb mode, and things of that nature. Are they actually helpful or do they just put a bandaid on the bigger issue?” I would even add to that list things like accountability and not having junk food in your pantry. Is removing the things from your life that are distractions or keeping you from doing what you want to do actually self-discipline, or is that making it so that you don’t have to exercise self-discipline? 12:29 Sean: Is the question like, if you’re locked in a cell and there’s no cupcakes, so you don’t eat cupcakes, is that self-discipline? 14:51 I’m not saying to buy cupcakes and then don’t eat them, I’m talking about having that stuff around because you live with other people that don’t have a problem with those things. In favor of developing self-discipline, should you not seek out ways to completely eliminate those things from your life? Eliminating them is ok sometimes because it makes it easier, but should you exercise and build your self-discipline by being around those things and consistently choosing not to indulge? 15:29 Sean: That’s well-meaning and I think it’s the place we should strive to be, but you want to be proactive in removing as many distractions or temptations as you can in the beginning. Otherwise, let’s just put the person who’s addicted to cupcakes in a room filled with cupcakes to the ceiling. I’m not sure that will actually help them. Eliminate as many distractions and temptations as you can because there will still be plenty that you can’t remove. 16:08 You can remove all of your cupcakes, but what happens when you go over to a friend’s house and they have a big stack of cupcakes? Let’s say you use a blocker on your computer that restricts your access to Facebook, Twitter, or Reddit, what happens when you forget and a friend texts you a funny meme and tells you to check out a Top 10 List post? That’s not something you thought to remove, it just came up, and saying no to that is what’s going to build your self-discipline over time. Eventually, you’ll get to the point where you don’t need the blocker or the cupcake will still be there and you’ll say no. 3. Don’t Wait Until You “Feel Like It.” Schedule It. 17:42 I’ve actually said this a lot, but I’m going to say it again (Related: e154 Perseverance and Sticking With Commitments). There’s going to be days where you don’t feel like doing something. If you want to develop a good habit, you have to do things you don’t feel like doing. 18:47 Ben: You’ve said before, “This is something that I do,” and putting it that way makes it easier to commit to doing it. You have a morning routine—you wake up, stretch, start coffee, brush your teeth, comb your hair, etc. Having a routine eventually becomes something you don’t have to think about, it becomes something you just do. 19:51 Sean: The podcast is something we do. If I could magically press a button and an awesome helpful podcast made itself and was ready to go out, and I could stay in bed, I would have pushed that button today. I didn’t feel like getting up early and doing a podcast, although I’m glad I’m doing it now. At that moment I didn’t feel like it, but it was never a question of, “Should I do this or not?” because it’s something I do. People are expecting it because I put a public commitment out there, you’re coming over, and Cory’s coming over. It’s something I do and it effects the time around that too because I need to prepare for the show. 21:27 Ben: I think it’s really important to point out that now that you’re doing it, you’re glad you are. The most resistance we experience is before we start doing something. Once you start doing it, you may have to trudge through the first few minutes, but eventually your mind and your body catch up with you and say, “We’re doing this.” Once we start something, we have a tendency to see it through to completion. Even though you didn’t feel like it before we started, you’re here. You’re present. Saying, “On the other side of this, I’m going to feel differently,” is a tool you can use when you’re experiencing that initial resistance. If it was easy, you would already be doing it. 23:20 There are difficulties and you’re doing yourself a disservice by not acknowledging them, recognizing they’re there, and recognizing they’re things you’re going to have to face. Realize there’s a reason you haven’t been doing something and don’t ignore the fact that there are things that are keeping you from actually doing this thing, even if you’re not calling them out. What’s keeping you from showing up or staying committed? Figure out what that difficulty is and acknowledge it. You may feel like you’re lacking willpower but you can always make choices. 25:05 Ben: I recently heard someone talking about how we are very bad estimators. Inherently, we are bad judges of things. We tend to overestimate the benefits and difficulties, but what ends up happening in reality is very different. That’s why we’re such a short-term, reward driven culture. I think the more we think about it, the more we tend to estimate it incorrectly, which is the enemy of actually doing something. While I agree that it’s good to be realistic, you also have to ask yourself the question: how realistic can I be? If this is something that needs to be done and I’ve committed to doing it, and I overthink all of the possible outcomes, I might not actually do it. You really just need to do it—start and move forward. It’s like you’re trying to juke yourself by not thinking about it too much and just doing it. 27:13 Sean: It’s a balance because the goal is to do something, and a lot of times people need to hear the message of, “Just start doing it.” It’s the hardest right before you start, so getting started is half the battle. The act of doing something can be really intimidating, so I’ve found it helpful to take a step back from that and say, “Make a choice to do something, and then do it.” You’ve got doing, making a choice to do it, and behind that is thinking about doing it. The amount of thinking about doing it before actually making a choice to do it is minimal because you will overthink yourself out of it. I’m not saying you shouldn’t think about it, you should at least acknowledge the difficulties. You want to start working out? You’re going to feel sore. You want to start waking up early? You’re going to be tired. You want to consistently show up? You’re going to have to make sacrifices. 28:40 Ben: The power of acknowledging those difficulties is that they don’t blindside you on the other side and keep you from doing it again. When you first start, you already know what’s going to happen and it doesn’t keep you from continuing to do it. 29:20 We’ve talked before about the value of being around the right type of people and the concept of the three groups of people. There’s a group of people that are obviously self-disciplined by the way they live their lives, the choices they make, and the difficulty they’re not experiencing, and there’s the people who want to be self-disciplined. They’re trying to grow in their self-discipline but they’re not quite in that first group. Then, there’s the third group, which are people who either don’t know they’re not self-disciplined or they know and they don’t care. We’re talking about group two here and I’m assuming the people listening to this and are looking for tips to improve are in that second group or close to the first group. 30:59 You’ve got to get around other people who have self-discipline. If you’re in the second group, you’ve got to get around the first group of people. It’s the same principle that applies when you want to see improvement in your life and you want to be more goal oriented. 31:14 Sean: You become the company you keep. It’s one of those things you realize when you’re older that your parents were right about. 31:55 Ben: Look at it objectively, look at the people you spend the most time with in your life and you’ll see that you’re similar in the way you make decisions, your self-discipline, the kind of values you have, and even what you buy. For example, I had a PC and I wasn’t much of an Apple person but when I started hanging around more people that were Apple fans, I started to shift in that direction. I’ve experienced that in many aspects of my life. 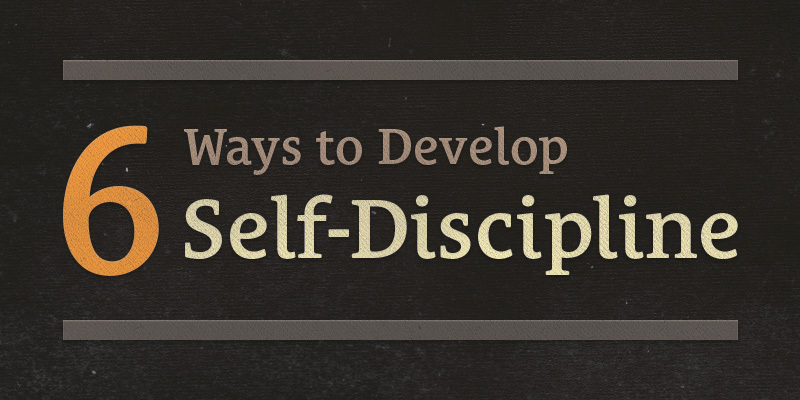 Spend time around other people who are self-disciplined. I’m not talking about asking them for tips on it, just see them demonstrate it in their lives. 33:29 Sean: You have this tendency to be like the people you’re around and that’s just the reality, and you’re saying to use that to your advantage. Whether you like it or not, you become more like the people you’re around. 33:43 Ben: You’re witnessing the way they demonstrate their self-discipline and it’s going to make you a little bit more likely to make the same kind of choices in your own context. 34:13 Sean: If someone you respect asks you to do something, are you going to do it? Of course you are, you respect them! Now, what about yourself? What if you tell yourself that you’re going to do something, are you going to do it? If not, you’re lacking self respect. It’s actually a deeper issue than just self-discipline. Self-discipline comes from self respect. 34:47 Self-discipline is saying you’re going to do something and following through with it, regardless of whether it’s comfortable or not. If you’re willing to do that for someone you respect and you’re not willing to do it for yourself, that means you have a lack of self respect. 35:14 Ben: This is something I struggle with and I’m glad you’re highlighting it because I think a lot of times people are struggling with self-discipline and they don’t realize the root of that is the lack of self respect. Simply being aware of that helps me to think about self-discipline in a different light. As a parent, I’m in a position to make decisions for my children since they’re not old enough or responsible enough to make those decisions for themselves, like the food they eat. I make decisions about when they eat, the kinds of food they eat, and the kind of treats they get because up to their own devices, they’ll go crazy. 36:59 I want to create a foundation for them of what it looks like to eat healthy, so they go into adulthood where they don’t have a bunch of health issues already. I want them to see what it means to limit yourself and make healthy choices but every once in a while, they come into out bedroom and Rachel and I have hamburgers or frozen yogurt with candy toppings. It’s a hypocritical thing, right? I like the feeling of, “The kids have gone to bed, now we can be bad.” I’m struggling with this though because the lie I might be believing is that this is a reward, because I’ve exercised self-discipline not just for myself, but for my children too. I’m extending discipline beyond myself and I do so much of that, I deserve a reward. 38:41 My reward is food that’s bad for me, but the question I have to ask myself is: is this really a reward? Maybe it satisfies something or it’s comforting in some way vs. the other goals I have that those actions come into conflict with. The other goals I have being living a healthy lifestyle, being in shape, and living longer. I know there’s a healthy balance there. It can’t be all or nothing, but I think of those things as rewards and the question is, are they really? Or is the better reward knowing that I’m going to reach my long-term goals, even though in the present it’s not satisfying some need I think I have. 40:10 It’s liberating but at the same time a little bit challenging and scary to shift my mindset to think about those things for what they really are. I want that but I’m scared. I’m afraid I can’t change my lifestyle and I’m afraid if I do, I’m not going to feel as satisfied. The only way to get past that is to step out into those waters and do it. I’m not going to know what the outcome is until I step out. 41:00 Sean: You’re sharing here in a public forum and I feel like it’s helping you to talk through these things, identify them, recognize them, and acknowledge them and I can only say that having accountability is very beneficial to me, and that’s coming from someone who feels like a very disciplined person. Getting around people on a regular interval that are going to talk about whatever this thing is you want to commit to. It’s a three-fold cord: public accountability, partner accountability, and personal accountability (Related: e107 Why You Need an Accountability Partner & How to Find One). If your personal accountability is weak, e.g. you don’t have self respect to source your discipline from, then you need to tie it together with these other forms of accountability—making a commitment in front of people and getting a partner who you meet with every week. 42:48 Ben: For whatever number of vices you have, you don’t need to find a single person who’s going to help you stay accountable for all of them. You can even find accountability online and one example of that is an app called My Fitness Pal, where you can track your calories and nutrition, but it’s also an online community. It connects with your Facebook friends who also use this app. You can ask them to keep you accountable because the app will update your feed every time you complete an exercise or food entry and your friends can keep an eye on it. I don’t want for people to feel like they have to arrange an in-person meeting once a week in order to find accountability. There are other ways you can find accountability. 44:24 Sean: I also want people to realize, you don’t have to pair with someone that’s a master of whatever you’re trying to do. If you want to be fit, you don’t have to find a professional fitness trainer to pair up with for accountability. It can be with someone who’s in the same spot as you, as long as you both have a commitment to each other in showing up. That’s what you need. 46:17 I thought that was interesting, especially how his laziness effected other people because a lot of times we can be selfish in our laziness. You don’t want to ignore the issue of self respect but sometimes it helps to realize it does effect other people and if you care how it affects other people, it can be a motivator. 46:44 Ben: It’s not a one or the other kind of thing, like, “If you’re not going to do it for yourself, at least do it for them”. Do it for yourself and do it for them. 47:30 Ben: One of the benefits of things like meditation and yoga is developing self-discipline because you’re focusing on your breathing and purposefully not thinking about things. It’s almost like you’re witnessing yourself exercise self-discipline by doing those things. With Cory’s example of doing small things, when you make the decision to do something that’s going to help in the long-term vs. short-term, you see yourself do that and the more you see yourself do that consistently, the more it’s going to come naturally to you. 48:15 Sean: So many things change when you extend your vision and think about long-term vs. short-term. If you mentally zoom out and envision where you’re going, you realize everything you’re experiencing now is a step along the way. 48:53 It helps you put all of those seemingly big things into perspective as smaller parts in a bigger puzzle that’s getting you to where you want to be. 46:26 Sean: I feel like, “don’t do this,” is something someone else usually tells you. You hear this message of, “don’t do this,” but saying, “I won’t,” instead is taking ownership of it. 49:41 Ben: Another distinction he made was the different between, “I shouldn’t do this,” and, “I’m not going to do this.” You could even go the other way with that and try not to say, “I should do this,” because there’s an obligation and guilt that plays into that vs. saying, “I will do this.” It’s an exercise of the will and there aren’t outside forces making you make that decision. ALL of our programs are now included with membership ($7,500+ value).